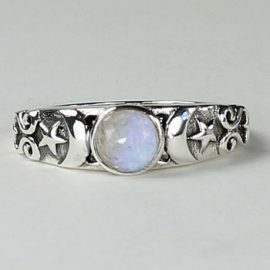 This triple moon ring in sterling silver is adorned with a round faceted rainbow moonstone. You will appreciate the detail and low key design for everyday or casual wear. The triple moon is a Goddess symbol that represents the maiden, mother, and crone as the waxing, full, and waning moon. 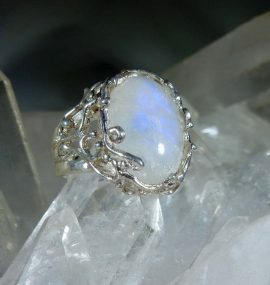 It is also associated with feminine energy, mystery, and psychic abilities. 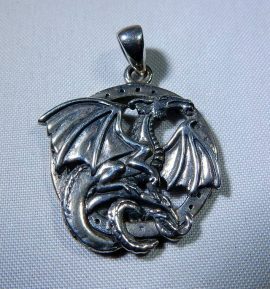 Dragon Pendant in Sterling Silver is sure to please with its detail and depth. 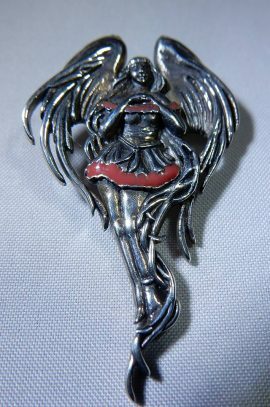 You can wear this charm for protection and strength alone or combine it with other charms. Let of the energy of the dragon spirit help you. 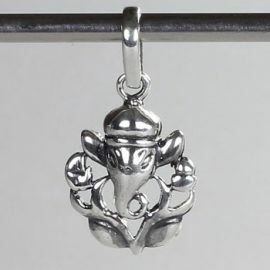 This petite sterling silver Ganesha pendant is great for removing obstacles in your life. Ganesha is one of the most distinctive Hindu deities with his large elephant head and human body. He plays a dual role of a supreme being powerful enough to remove obstacles and ensure success or create obstructions for those whose ambition has become destructive. 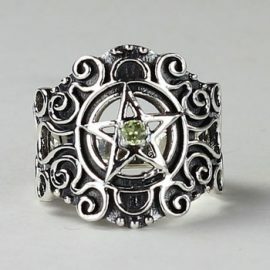 This pentacle ring with peridot in sterling silver is ornate with 3mm faceted peridot in the center of a pentacle. You will enjoy the filagree detail of this piece. The five-pointed star represents the four primary elements (fire, earth, air, water) and the fifth branch embodies the spirit. The circle around them creates life. 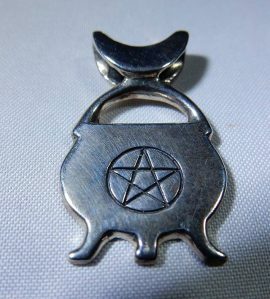 Cauldron with Moon and Pentacle Pendant in Sterling Silver is a nice little addition to your collection. 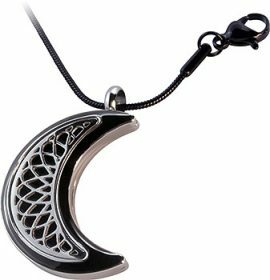 You can wear the magic of the moon and cauldron together in this pendant. 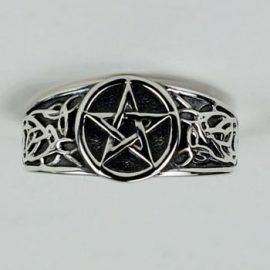 This pentacle ring in sterling silver showcases a beautifully adorned centerpiece for you. The five-pointed star represents the four primary elements (fire, earth, air, water) and the fifth branch embodies the spirit. The circle around them creates life. This chalice well pendant with double pentacles in sterling silver. 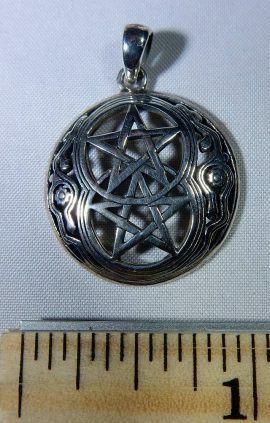 Double pentacles, pendant is sterling silver and length is 1.25″ from top of bale. Many cultures and religious traditions assign meanings to each of the pentacle’s five points. The top point often symbolizes gods, goddesses, spirit, or other aspects of divinity. The divine unites the other four points. The points symbolize earth, fire, water, and air, each of which aligns with a particular emotion or virtue. You will enjoy the energy of this crystal quartz point with faceted garnet and Merkabah pendant in sterling silver and gold accents. This large powerful piece is sure to delight you with its detail and high quality gems. Merkabah, also spelled Merkaba, is the divine light vehicle allegedly used by ascended masters to connect with and reach those in tune with the higher realms. “Mer” means Light. “Ka” means Spirit. “Ba” means Body. 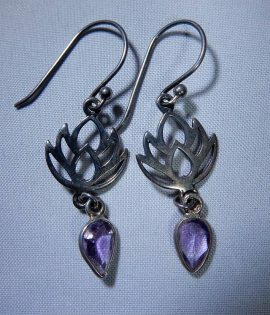 This lotus flower with amethyst earrings in sterling silver will take your breath away. These earrings have a great movable design that allow the amethyst to catch the light as you wear them. The lotus represents divine beauty and purity, while the unfolding of its leaves represents the expanding of the soul and spiritual awakening. 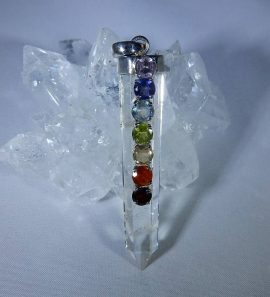 This sterling silver setting with a faceted gemstone om symbol pendant. Length is 1.25″ from top of bale. 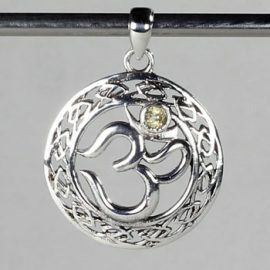 Om is an ancient mantra that is used in Hinduism and Buddhism, among other faiths. In the Hindu tradition, the sound om is said to contain the entire universe. It is also a seed syllable, used as a building block for other mantras. 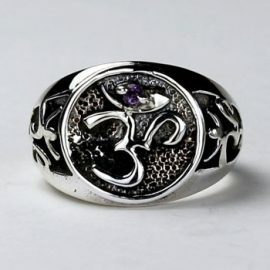 This om ring in sterling silver is a stunning ring. The design is big enough for men or a bold statement for women. Please note: Photo shows this ring with amethyst. This listing is for the same ring except with faceted citrine. Om symbols form a circle around the edge of this delicate ring. Ring is adorned with 2mm faceted citrines. 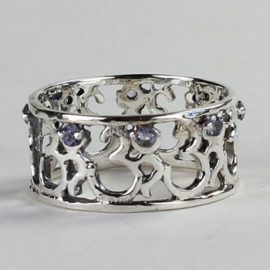 This OMs Ring with Iolite in Sterling Silver is a great piece you will want to wear all the time. Om is an ancient mantra that is used in Hinduism and Buddhism, among other faiths. In the Hindu tradition, the sound om is said to contain the entire universe. It is also a seed syllable, used as a building block for other mantras. Om symbols form a circle around the edge of this delicate ring. Ring is adorned with 2mm faceted iolite. Om symbols form a circle around the edge of this delicate ring. 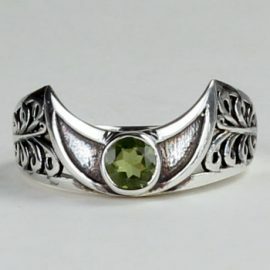 This OMs Ring with Peridot in Sterling Silver is well crafted. Om is an ancient mantra that is used in Hinduism and Buddhism, among other faiths. In the Hindu tradition, the sound om is said to contain the entire universe. It is also a seed syllable, used as a building block for other mantras. Please note: photo shows this ring with amethyst. This listing is for the same ring except with peridot. Om symbols form a circle around the edge of this delicate ring. Ring is adorned with 2mm faceted peridot. 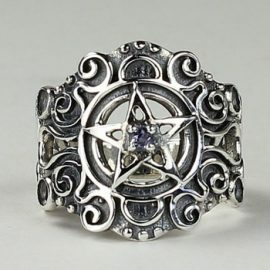 You can see this stunning pentacle ring with amethyst in sterling silver is ornately set with 3mm faceted amethyst in the center of a pentacle. The five-pointed star represents the four primary elements (fire, earth, air, water) and the fifth branch embodies the spirit. The circle around them creates life. 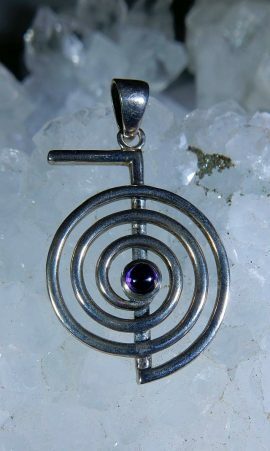 You will love wearing this Reiki Symbol with Amethyst Pendant. The amethyst aids in the healing and protection. 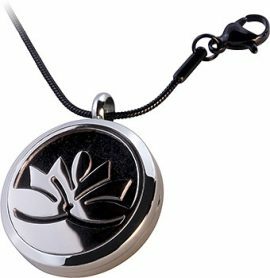 It is especially perfect for healers to wear during sessions. 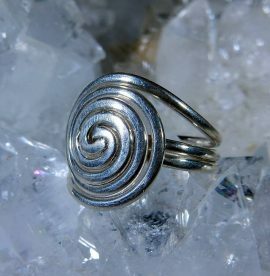 This spiral ring in sterling silver will be a symbol of your personal journey. Let the feminine energy of the sterling silver guide you on your daily path. The symbol of the spiral can push the wearer to be flexible and have trust when things change. 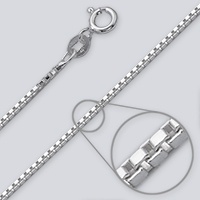 This is a solid sterling silver box chain 16″ in length. You will enjoy this design it is durable and stylish.